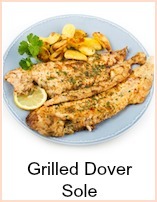 If you're a beginner at cooking fish then grilling fish recipes are probably the easiest. 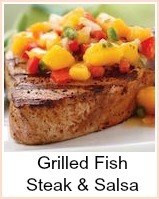 You can flavor your fish with a marinade and keep it moist by brushing it every time you turn. You can keep an eye on how the fish is cooking because it’s easily seen and assessed – you can adapt the time accordingly. Prepare some plain boiled new potatoes or crusty bread and either some buttered veg or a salad, those side dishes won't spoil whilst you cook the fish – or you can re-heat them in the microwave quickly during any of the grilling fish recipes time. The timers will be ringing all over the kitchen and will maybe send you mad, but you’ll get the best results. The fish will take only a few minutes to grill depending on the thickness and it's important to serve it hot, so if your side dishes are ready, you can easily adjust the timings of the fish. These timings are good for grilling on the barbecue or broiling. For fillets, you'll need about 2 to 3 minutes each side under a pre-heated grill. For steaks, you will need up to 10 minutes according to the thickness - turn them three or four times. It's better to turn more frequently - that way, the fish cooks evenly and if you're basting with marinade, it will stay moist but get a lovely crispy flavored crust. A pastry brush is ideal, but keep it just for the fish – no matter how well you wash it, it will get oily and highly seasoned – you’ll be using garlic, onion and other strong tasting flavours – not good for your delicate strawberry mille feuille! Use your timer – a minute or two passes very quickly. A simple rule of thumb is to measure the depth of the fish at its thickest point. Lay it on a flat surface and measure it with a ruler. It needs about 10 minutes total cooking time per inch. So, if you calculate a steak as being an inch thick and needing 10 minutes cooking time - cook it for 3 minutes, turn, cook another 3 minutes, turn then 2 minutes, turn, 2 minutes and it’s ready to eat. Test that it’s cooked by pressing it with your finger – be careful, it’s hot!! If it’s ready, it will be firm to the touch – as a beginner, press it each time it’s turned, that way you will be able to assess what feels raw (you know, because you’ve not cooked it yet) and what’s cooked. 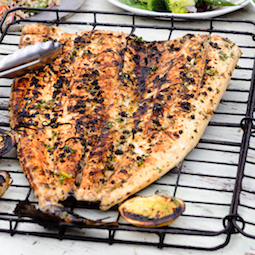 Any fish, any thickness can be used in your grilling fish recipes. At the simplest level, take the juice of one lemon, add some chopped parsley, ground black pepper, a tablespoon of olive oil and mix together well. Place the fish in a shallow dish and pour over the mixture. Marinade for 20 to 30 minutes, turning every 5 minutes and spooning over the juices. Line your grill pan with foil and brush the grill with butter or olive oil. 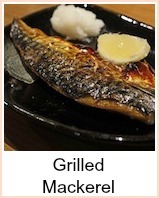 Make sure your grill is really hot before putting the fish under. Use your timing calculation - remember it's better to turn a couple of times to ensure an even cooking. Baste with the marinade before you start, turn and baste again. On the last 'turn' tip the remaining marinade gently over the fish - the juice from the fish and marinade will collect in the bottom of the grill pan. Put the fish onto warmed plates and pour any juices remaining from the grill pan over the cooked fish - some of it will have crusted onto the foil and if you scrape it, you'll get bits of foil. You can get round this by not lining the grill pan with foil which means you can scrape the fish juices off - but it will be harder to clean - your choice here - ease of cleaning or extra juice - it's a tough one! Serve with your prepared side dishes. 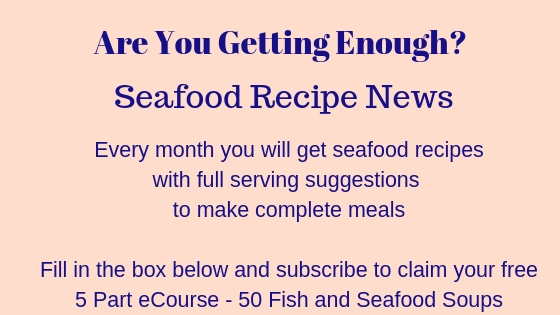 Easy, grilling fish recipes - for more specific recipes and ideas, click here for the grills and barbecue index. Any fish you can grill, you can barbecue - and vice versa. The cooking times might vary - you need to keep an eye on the barbecued fish to make sure it doesn't burn - coals aren't as easy to control as a domestic grill. The marinades and other ingredients remain the same.